Hot disagreement and debate broke out about how Jesus’ words should be interpreted. The focus of the debate centered on the meaning of the word, this. What should this in the words of Jesus be understood to modify? The Protestant team of theologians launched an impressive argument that the word this should be understood to modify glass – the object that was taken from the cupboard and the central noun that precedes in the sentence. Yes, they agreed, the word this does also relate to water, but only in a symbolic sense. 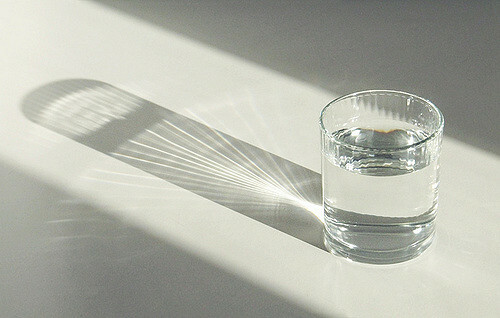 The glass should be understood to only represent water for two compelling reasons. First, reason recognizes that glasses are not water and water is not a glass. Secondly, everybody knows that cupboards are places where dry glasses are stored. The Roman Catholic representatives insisted that the word this should be understood to modify water. The singular impersonal pronoun this, is functioning as the subject of the independent clause; this is water; and, it modifies the predicate nominative, water. Granted, they conceded, glasses are not water and water is not a glass. However, all need to take into account that Jesus is at work here – the same one who changed water into wine at the marriage feast at Cana. So, while Jesus began taking a glass; He then performed a miracle and changed the glass into water. Yes, the outward characteristics of the glass still remain (it still looked like a glass), but the true substance of what was given to his friends was nothing but pure water. Among all the representatives, however, it was the Lutherans who were the laughing stock of the debate, advancing a position that all the others considered most untenable. The Lutherans insisted that the word this should be understood to modify both glass and water. They maintained that in the glass, water was truly and substantially present. The friends at the table could not receive the glass without the water or the water without the glass. What we have here, they insisted, is a communion of the water and the glass. While a mystery, all should accept this simply because Jesus said so. The Protestants ridiculed the Lutherans charging them with a gross contradiction. Simple reason understands that glasses are not water and water is not a glass. The Reformed wanted to grant a communion of sorts, but agreed with the Protestants that only a glass was given to the friends at the table. However, maintained the Reformed, the true elect of God at the table also received water, but only by faith. In addition, all of the parties charged the Lutherans with making a gross grammatical error. If an impersonal pronoun is to modify more than one thing, you must employ plural pronouns, these or those. However, they chimed, Jesus said this! But alas, the Lutherans would not budge. Concerning the matter of the singular pronoun, they observed that simple grammar requires a singular pronoun when there is a union of objects (e.g. glass and water) – where you cannot have one without the other. In all such cases, you must use the singular not the plural pronoun. While certainly a mystery, the Lutherans just stubbornly insisted that everyone should take Jesus to mean what he said, because he said what he meant. There is a real presence of the water with the glass for the simple reason that he said so. Now, concerning the hoped-for consensus from the colloquy, they have not been able to live happily ever after… not yet.